Suu Kyi was awarded the Freedom of the City in 2012. A NUMBER OF Dublin City Councillors have said they believe Myanmar’s leader and Nobel Peace Prize winner Aung San Suu Kyi should have the Freedom of Dublin award rescinded. Their calls come amid criticisms of Suu Kyi’s response to the plight of the Rohingya minority. Tens of thousands of people have been fleeing across the border into nearby Bangladesh to escape ethnic violence. At least 1,000 people are known to have been killed. Human rights activists and world leaders had condemned the country’s leader for her silence on the treatment of the Muslim minority. Then Suu Kyi released a statement this week in which she said a “huge iceberg of misinformation” was distorting the picture of what was happening. In her first comments since militant attacks sparked unrest on 25 August, Suu Kyi was quoted by her State Counsellor’s office as saying fake news was “calculated to create a lot of problems between different communities” and to promote “the interest of the terrorists”. She said the government “had already started defending all the people in Rakhine in the best way possible and expressed that there should be no misinformation to create trouble between the two countries”. Almost 400,000 people have signed a petition calling for the Nobel Peace Prize Committee to take back the prize it awarded to Suu Kyi. Now some of Dublin’s city councillors say the Freedom of the City, which was awarded to her in 2000 (though she only received it in 2012), should be taken back as a demonstration of the city’s opposition to her behaviour. Independent Mannix Flynn said that when this award is given to a person, “they have to have a certain etiquette and standard”. He will table a motion on the issue with the council’s protocol committee later this month. This is a Jimmy Savile moment. Honouring someone for their stance and humanitarian and peaceful approach to changing a country and now seeing what is going on in the country with the military – Dublin City Council and councillors in this instance could be construed as having blood on their hands. The Freedom of the City of Dublin is an honorary award that has been given to 82 people as recognition of the significant contribution they have made to public life. People Before Profit Alliance councillor Tina MacVeigh also tabled a motion to have the award rescinded earlier this week at her local area committee meeting. This is expected to be discussed at the committee’s meeting later this month and McVeigh said it may then be referred to the full council. “I don’t think she should have that honour given that she has been not just silent on the issue, but has recoiled when challenged on the plight of the Rohingya people from acknowledging that they are being persecuted. This is a pretty dire situation. Explainer: Who are the Rohungya, and why are hundreds of thousands fleeing Myanmar? At the council’s meeting on Monday evening, Labour’s Dermot Lacey requested the Lord Mayor write to the government of Myanmar to express the council’s disappointment at Suu Kyi behaviour in relation to the treatment of the Rohingya people. 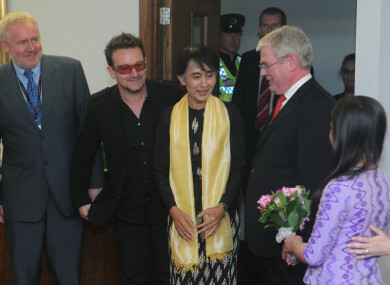 Speaking to TheJournal.ie, Lacey, who has been a member of Burma Action Ireland for more than 17 years, said he was the person who had internally proposed Suu Kyi receive the Freedom of the City. “I said it to Mary Friel, who was Lord Mayor at the time, and she formally proposed it. So I felt given what is happening in Burma, certainly, on this issue she is letting us down. I know it’s a very complicated country and she herself is treading on a tightrope, but this behaviour is not conducive to the great woman we believed her to be when we gave her the award,” he said. Lacey said Suu Kyi has “an obligation she is not fulfilling at this time”, but he said he believes the best approach is to “let her friends encourage her to behave better rather than threatening her”. His party colleague Rebecca Moynihan declined to comment on whether the award should be taken away from Suu Kyi, though she did express strong criticisms of the leader. “She is a Nobel Peace Prize winner and people stood with her when she was being discriminated against and put in jail for her own political viewpoints,” she said, adding that Suu Kyi now “has a responsibility to stand against the military”. Fine Gael’s Ray McAdam said he was “deeply troubled by her lack of action in terms of protecting the Rogingya people”. “I was delighted that she was awarded the honour of the Freedom of Dublin in 2000,” he told TheJournal.ie. However, she is now standing idly by as the Rohingya people are being raped, attacked and murdered. The UN has said that more than 250,000 Rohingya have fled the violence. This, in effect, is ethnic cleansing. It is no different to that which occurred in the Balkans during the late 1990s. Such inaction is besmirching the honour of the freedom of Dublin granted to Aung San Suu Kyi and in light of this, the removal of such an honour should now be considered by Dublin City Council. Social Democrats councillor Gary Gannon said he believes it is likely councillors will decide the best course of action is to take back the award. Email “'We could have blood on our hands': Councillors want to take Freedom of Dublin off Aung San Suu Kyi”. Feedback on “'We could have blood on our hands': Councillors want to take Freedom of Dublin off Aung San Suu Kyi”.